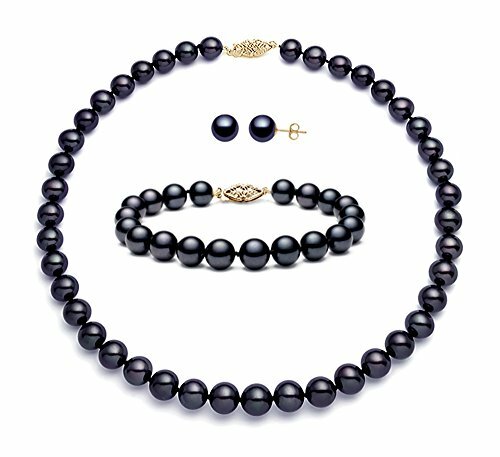 This gorgeous set of black Freshwater cultured pearls includes a necklace, a bracelet and a pair of matching earrings. The necklace is 17" and the bracelet is 7". They are knotted in-between each cultured pearl and finished with a beautiful sterling silver clasp. These cultured pearls are fine AA+ quality, with good luster and smooth surface. They are dyed dark black color for an eye-catching look. This jewelry is hand made by our skilled jewelers in USA and quality controlled strictly by our cultured pearl experts. It comes with a high quality jewelry box and a certificate of authenticity. About Freshwater Cultured Pearls Stunningly beautiful and wonderfully affordable, Freshwater cultured pearls make an excellent gift. Unlike many button-shaped Freshwater cultured pearls, ours are mostly round and look very similar to Akoya cultured pearls. Round or near-round Freshwater cultured pearls with a clean surface and remarkable luster are considered the highest quality. Premium Pearl, Inc is a team of highly skilled cultured pearl experts, jewelers, and jewelry designers. We travel around the world to find the most beautiful cultured pearls used in our jewelry. Premium Pearl, Inc has been featured in major publications such as USA today, Audrey Magazine, and L.A. Brides. This gorgeous set of black Freshwater cultured pearls makes a perfect gift for her. They are fine AA+ quality, with good luster and smooth surface. The necklace is 17" and the bracelet is 7". They are knotted in-between each cultured pearl and finished with a beautiful sterling silver clasp. These cultured pearls are hand selected from pearl farms to ensure its highest quality. The jewelry is beautifully made by our skilled jewelers in USA. If you have any questions about this product by Premium Pearl, Inc, contact us by completing and submitting the form below. If you are looking for a specif part number, please include it with your message. Dyed Lavender Color Baroque Freshwater Cultured Pearl Strand, 50"
Women's Multi-Strand Multi-color Simulated Pearl, Gray Faceted Crystal Bead Layered Necklace, 36"
6.5-7mm 14k White Gold Black Akoya Saltwater Cultured Pearl Necklace AA+ Quality, 18"